What does your role consist of at Alexandra Palace? I form part of the Sales Team who are responsible for programming the diary of events for Alexandra Palace, supporting the Charitable Trust strategic priority, of becoming financially self-supporting. We are London's largest independent venue with all income from commercial events,(including film shoots), going back into maintaining the Palace for all to enjoy. We book events within the main venue itself, 196 acres of Parkland, Ice Rink and excited about the new addition of the Theatre. I am responsible for looking after the music, filming, corporate accounts and involved in developing some of our in-house branded events. We now have a number of in-house events that we curate ourselves including The Great Fete which is one of the largest free community festivals in London, Fireworks Festival for 80,000 including a Bier Festival, StrEATlife, SpringFest and our new Christmas Carnival which will be celebrating the opening of our Theatre and East Court throughout December. What has been your most challenging film experience? No film shoot at Alexandra Palace is ever the same. It is a Grade II listed building so there are few considerations to take into account when trying to accommodate challenging requests from productions while protecting the building. We pride ourselves on being a flexible venue and the team here are incredible and always find a way to make it work. The most challenging film experiences were those taken most recently. A few months ago, we put the whole multi-million pound restoration project of the Theatre on hold for a week while we hosted a feature film. As you can imagine, being in the middle of a construction project posed lots of challenges including financial risks, so we worked closely with the construction and film production company throughout the planning stages. As a venue we love to push the boundaries of possibilities and work closely with all parties involved to face challenges head on and with a smile. What has been your most exciting or rewarding film experience? A truly magical experience was filming with BBC Music for their ident of God only Knows in the Theatre. This was filmed a few years before it closed for the restoration project when the space was still in a dilapidated state. Before the works, the Theatre had a raked floor so a lot of prep had to go into building out the floor to level it all out for the BBC Orchestra. Seeing the space come to life the way it did was incredible. What is the most recent feature or TV drama that filmed at Alexandra Palace? There have been a few big features this year that I am not at liberty to talk aboutbut I can't wait to see how they turn out. With 7 acres of building and 196 acres of parkland there is always something happening here! The most recent dramas filmed here was BBC's Rellik and Undercover. The beauty of Ally Pally is that we are a multi-location site which is great for productions who can come on site and film a number of different scenes in one place. The BBC took advantage of this for both productions and filmed all over our 196 acre Park, skate park, meadows, woodland and colonnades while still achieving different look and feels. What is your favourite part of the venue and has anyone ever filmed there? I have so many favourite parts of the venue and one of the highlights of my job is seeing different clients withenquiries that turn this historical venue into something new and exciting every time. Before the Theatre opened, 60% of Ally Pally was technically derelict and now it is only 12% so you can imagine all the interesting and scary parts of the venue that would be fantastic as filming locations. We produced our first ever arts and music festival this summer called Kaleidoscope and part of it saw the basements transformed into an immersive experience. I can't wait to do more down there. The Rose Window Balcony is often a beautiful gem that is often forgotten but offers an unrivalled view of London's Landscape. During the London Olympics we got to watch all of London celebrating from the balcony; it was a really special moment. We also had a feature film use the balcony as the focal point for their shoot, which was spectacular. The revamped theatre has just opened. Can you tell us a bit more about the space? The Theatre is truly special. The grade II listed Theatre opened its doors to the public on 1st December after been closed for over 80 years. It is an exciting new space for live music, filming, corporate events, comedy, theatre productions and everything in between. The restoration process has breathed new life into the space which has been preserved in this beautiful state of "arrested decay" and with a very much 'frozen in time' aesthetic. Every time someone comes into the Theatre they'll feel like they are discovering it for the first time. The space combines it's unique features with modern facilities such as retractable seating for flexible capacity will allow us to explore a wide range of possibilities and stage so many different events. For our opening season, we wanted to showcase the versatility of the space and we have programmed and eclectic array of events. When the theatre opened in 1875 it always hosted a range of productions, so we wanted to stay true to its variety and music hall roots. We have sold out shows with Letters Live, Ronnie Scott's Jazz Club, Dylan Moran and a three-week theatre production with Horrible Histories doing a Horrible Christmas. 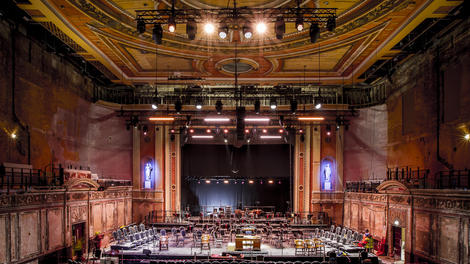 Ally Pally Theatre is a different offering to the main halls with a separate entrance via the newly refurbished East Court, retractable seating, full production PA, rigging and stage in situ. We are looking forward to seeing how the space will evolve and the different types of events and productions we will have come through. I honestly couldn't pick one but here are some of my favourites - Wild because it reminds me of travelling, Little Miss Sunshine just because, Baz Lurhmann's Romeo + Juliet and Mighty Ducks 1,2 and 3 which is my all-time favourite childhood film. Who would play you in a film bio of your life? Olivia Colman - because she is so talented and absolutely fabulous.